Samsung has filed some patents that show a smartphone with a 100% screen-to-body ratio and small holes for front camera and sensors. It is obvious to say that the smartphones of the future will be "full screen", but it is still not clear how a 100% screen-to-body ratio will be obtained. A patent filed by Samsung on May 12, 2017 and published yesterday by the WIPO (World Intellectual Property Organization), shows some possible solutions that could be adopted in the next Galaxy, one of which provides the positioning of the front camera and sensors under the display. The smartphones on the market today with the widest display area are iPhone X, Essential Phone (PH-1) and Xiaomi Mi MIX 2. The most "cumbersome" component is the front camera. Apple has created a cutout in the OLED panel, also used by other sensors, including those for 3D facial recognition. Instead, Xiaomi moved the camera to the lower frame (bottom right), while Essential created a small "notch". The latter solution is described in one of Samsung's patents. In the attached image you can also see a fingerprint reader under the screen. 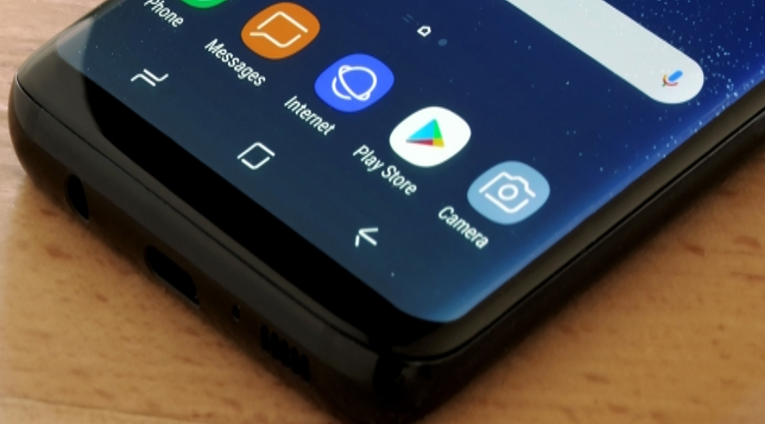 The biometric sensor has been moved to the back in the Galaxy S8 / S8 + and Galaxy Note 8, but the position is rather uncomfortable. With the Galaxy S9 / S9 + it will be moved under the rear camera, as in the Galaxy A8 / A8 +. Optical technology could be used in the Galaxy Note 9.